From left to right: US Secretary of the Navy Donald Winters, Congressman Joe Sestak, Israeli Ambassador to the United States Salai Meridor, and Commander in Chief of the Israeli Navy Eli Marom. Israel keeps its options open with both US political parties in pursuit of a naval miracle that might happen there. 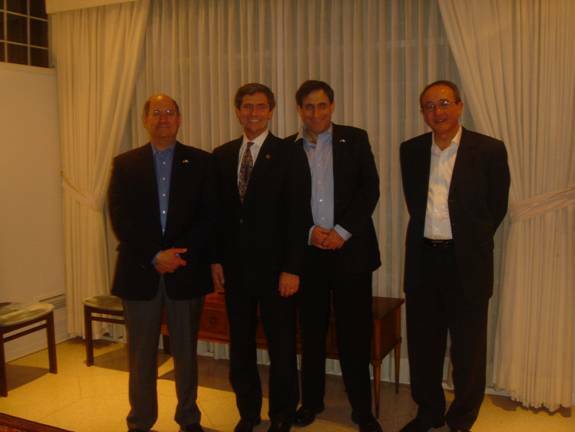 On the first eve of Hanukah, December 5, 2007, Congressman Joe Sestak (PA-7) and his wife, Susan, were invited to an intimate dinner at the private residence of the Israeli Ambassador to the United States, Salai Meridor, and his wife, No’a. They were joined by Commander-in-Chief for the Israeli Navy, Eli Marom, and his wife Ora; and the US Secretary of Navy Donald Winter, and his wife, Linda. After the lighting of the Menorah, Congressman Sestak, Ambassador Meridor, Commander-in-Chief Marom, and Secretary Winter discussed the state of Israeli’s military as well as foreign affairs, from Iraq and the Global War on Terrorism to the close relationship between Israel and the United States and their militaries. The dinner was followed by a private meeting the next day between Commander-in-Chief Marom and Congressman Sestak in his Congressional office about a variety of issues, including the potential of a joint venture between the United States and Israel on the development of Littoral Combat Ships (LCS), the newest proposed ship of the US Navy. 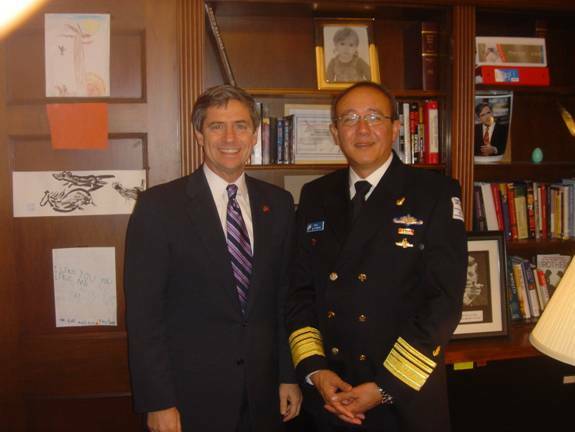 While serving as an Admiral in the US navy for 31 years, Congressman Sestak had many relations with Israeli military officers over the years, particularly those in the Navy – and has gained first-hand knowledge in the matters of Israeli military security. He believes that joint ventures such as the LCS would result in great mutual benefit by providing not only greater interoperability between American and Israeli militaries – while also driving down costs for procurement by working together – but would also greatly enhance the already strong relationship between these two countries. As a result, Congressman Sestak spoke to House Armed Services Committee Chairman Ike Skeleton, House Seapower Subcommittee Chairman Gene Taylor, and the US Chief of Naval Operations (CNO), Admiral Roughead. In fact, Congressman Sestak queried the CNO on bringing Israel into LCS’ development during a just completed hearing in the House Armed Services Committee. In this photograph, Congressman Joe Sestak (left) and Israeli Chief of Naval Operations Eli Marom. "I have visited Israel on more than six occasions while in the Navy, from the early 1970s through more recent times, including prior to entering Suez Canal when I was in the command of the aircraft carrier Battle Group GEORGE WASHINGTON for the transit to the war in Afghanistan and combat operations for Iraq. During this transit, I left an Aegis cruiser off the coast of Israel after integrating its radar system into Israel’s air defense system in order to provide for early warning against missiles that might be launched by Iraq during the oncoming war," said Congressman Sestak. "Through my 31 years as an Admiral in the US Navy, I have witnessed not only the great efficacy of the Israeli military, but also the value of Israel as the leading alley of our nation in that region. I intend to enhance this relationship in Congress as continued relations between the US and Israel are essential to developing and facilitating a lasting peace in the region." "As a world power, the United States must serve as the leading mediator of the Middle East conflicts. It is in our nation’s best interest to further strengthen our relations with Israel and create a peaceful Middle East," said Congressman Sestak. "To that extent, we must take into consideration the sensitive position of the Palestinian people in this situation, and follow the ideals and goals of the two state solution – which first and foremost calls for a unconditional cession of violence." While serving as a Director for Defense Policy under President Clinton, Congressman Sestak also helped plan Operation RELIANT MERMAID, the first ever military exercise between Israel and a primarily Islamic country, Turkey. Shortly thereafter, he was deployed to the Mediterranean to oversee the exercise as the senior US military representative present. "This Operation granted me a unique insight into the possibilities of where nations working together with US leadership present can lead to a more secure future," he said. "I hope to continue to work closely with both Israel and its military for lasting peace in the region." "I believe that safety and security will only be achieved by creating peace in the region, and a two-state solution is the most viable way to achieve this," said Congressman Sestak. "Therefore, it was an honor to meet with Ambassador Meridor, Commander-in-Chief Marom, and Secretary Winter to discuss the relationship between our great countries, and the prospect for enhancing this relationship."